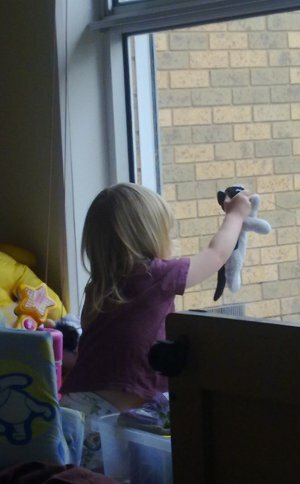 This entry was posted in Family and tagged children, elspeth, imagination, kids, toddlers. Excellent! We’ve got little dinky computer thingies, phones that take pictures…but there’s STILL nothing technological that can match the excellence of that kind of beautiful humanity. Thankfully Elspeth hasn’t started on “WHY everything” yet… it can’t be far off, though! Love it! I was in Melbourne over the weekend (love it…) and your weather wasn’t so great, but it was good anyway. Your pollen nearly killed me though. Seriously. Sorry Kim, he’s vital for bedtime! I’d never get Elspeth to sleep without him!